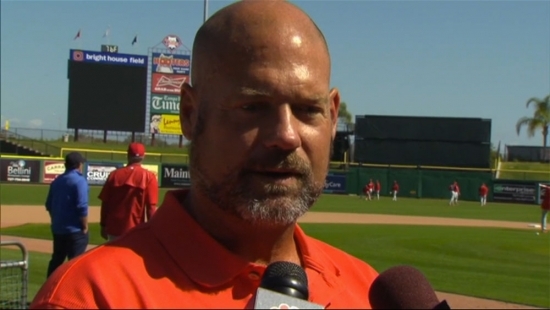 Former Philadelphia Phillies Catcher and member of the 1993 National League Championship team, Darren Daulton, stopped by spring training on Sunday. The 53-year-old revealed in the summer of 2013 that he was battling brain cancer. Today he had much better news. “When the doctor walks in and opens the door and he starts smiling, then everything is cool. I can do whatever I want. Everything is good.” A recent MRI has show that the tumors are gone and Daulton is now cancer free. Daulton looked tan, with a smile on his face, as he made his way around the field on Sunday. He had to endure a lengthy surgery followed by chemo and radiation treatments but doesn't seem any worse for wear. Phillies faithful can breath easier knowing one of the good guys is pulling through. Daulton now lives in Clearwater, FL. SEE ALSO: Darren Daulton Surgery "went well"
An underground fire in Center City late Sunday afternoon triggered an explosion and some evacuations of nearby buildings. It all happened around 5 p.m. at 15th and Locust Streets. A smoldering underground PECO electrical wire caused pressure to build up under the streets eventually blowing a manhole cover off. Smoke and fire could be seen coming up out of the hole. The smoke also raised carbon monoxide (CO) levels in buildings on the 1500 block of Locust Street and firefighters had to evacuate and then ventilate the structures. A restaurant and a gym across the street from the manhole explosion were emptied right away. No one was hurt and no buildings were damaged, but PECO is working to repair the damage from the fire. Officials say a fire in a dorm at Cheyney University in Delaware County on Sunday morning was arson. It happened at 6:30 a.m. on the 5th floor of Tubman Hall at the Glen Mills college. Officials say a group of unknown people set a student's belongings on fire in a door room. The room's occupant was not present at the time. The fire tripped the alarm and the dorm room's water sprinklers turned on. A Cheyney University officer was taken to the hospital complaining of chest pains and smoke inhalation. The incident is under investigation. A 13-year-old boy was shot in Wilmington, DE, on Sunday night. It happened at 7:15 p.m. in the 200 block of South Heald Street near Lobdell Street. The victim was shot once in the legs. He was taken to A.I. DuPont Children’s Hospital in stable condition. There are no suspects at this time and police are still investigating.